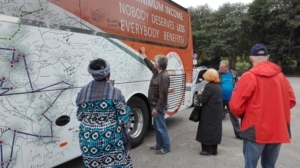 The surprises continue at the #eminbus. Today the tall versions of the Prime Minister, Erna Solberg, and the leader of the opposition Labour Party, Jonas Gahr Støre, turned up to sign the bus. It may just be in time, while social insurance provides good protections in Norway, investment in the social assistance schemes is low, resulting in poor quality schemes. This was the clear message from Bjørn Hvinden, Director of the Nordic Centre of Excellence in Welfare Research, in the round table that took place at the bus. Our colleagues from EAPN Norway, highlighted the variation in the level of social assistance (between 300 and 600 Euros approximately) depending on which region you live in. They also highlighted the devastating impact of the requirement to devest of any assets (car, motor bike, flat…) before qualifying for social assistance. Driving people deeper in poverty and making the road back to recovery much steeper. Such conditions around access to minimum income schemes need to stop immediately. 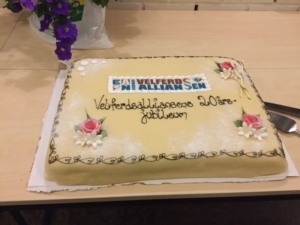 In the evening it was the chance to celebrate 20 Years of the Norwegian Welfare Alliance /EAPN-Norway. An anthology of real life stories of struggle and triumph over difficult circumstances was published to mark the occasion. Readings from the anthology was central to the celebration. 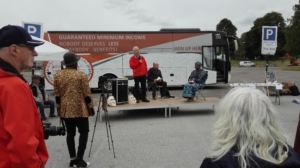 A message of congratulations to the Welfare Alliance/EAPN Norway for all they have achieved in the last 20 years and best wishes for the next 20 was delivered by Leo Williams, Director, EAPN.